Welcome back. 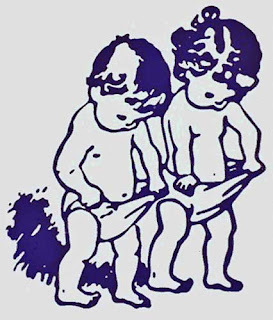 In case you were wondering, men and women are different. OK, you probably knew that. But I bet you didn’t know that the difference extends to how men and women gaze at faces. That’s what investigators from the UK’s University College London, Queen Mary University of London and University of Nottingham found recently. This all began when earlier research showed that everyone has their own eye-scanning pattern when gazing at faces. Who cares? Well, gaze-based models have significance for fields varying from computer vision to clinical psychology. Since the face is central to social interactions, quantifying the nature of face processing is critical to understanding and diagnosing disorders, such as schizophrenia, autism and attention deficit hyperactivity disorder. To learn that eye-scanning patterns vary with gender, the investigators collected data on 405 visitors to the Science Museum of London. These test participants included 203 males, 202 females, ages 18 to 69 (average 31), of 58 nationalities. Testing of each participant took about 15 minutes and involved three phases. First, the participants completed a 10-item questionnaire that provided a measure of their personality traits. Second, an eye-tracking device monitored the participants as they looked at computer-hosted video clips of the face of an actor. The actor gazed briefly toward the bottom of the display, then forward directly at the participant, and finally back toward the bottom of the display. In all, each participant viewed 40 videos, 35 of which varied only in the length of time the actor spent gazing forward at the participant. After each of the 40 videos, the participant indicated via a mouse button if the length of time the actor gazed forward felt uncomfortably short or uncomfortably long for a real interaction. To characterize gender differences in gaze behavior, the investigators grouped the data as male watching male (119 cases), male watching female (84), female watching male (106) and female watching female (96). As you might expect, the results showed that males watching females showed the largest increase in eye pupil diameter. 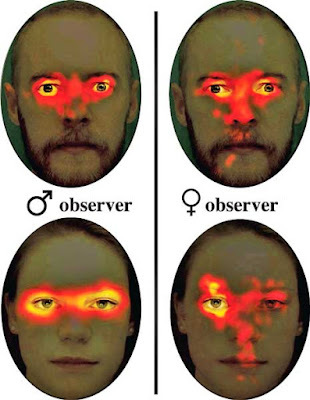 But the analysis also showed: female observers made shorter fixations and larger rapid eye movements between fixation points (saccades); female gazing was more scattered or exploratory than that of males; females watching females were biased toward looking at the actors’ left eye; and males and females were both more likely to gaze at the eyes of an actor of the opposite gender than of the same gender. The study demonstrated that gender is a key variable influencing gaze patterns during face exploration. Despite employing the largest, most diverse eye-tracking database, the study had too many limiting factors to establish that gender is the key variable in all cases (e.g., the use of video clips, having only Caucasian actors, and having the actors keep their head still and maintain a neutral facial expression without speaking). Nevertheless, it’s an interesting study and one more reminder--in case you forget--there is a difference between women and men. Thanks for stopping by.